I have to say, I am so very excited about wrapping this up. I was able to get several individuals their games during Phoenix Comicon; and right now, others have games on the way to them. I am almost completely done fulfilling the obligations of the Kickstarter and my promises to the backers, six months later. It is not long for a Kickstarter, but it is longer than I wanted. I am considering doing another Kickstarter soon, now that I know the pitfalls and can expedite things. I hope I don’t lose the faith of the backers from the first Kickstarter because the product came in later than I anticipated. I know for Kickstarter it is pretty good to only be a couple months late, but it’s not what I wanted and I hope to predict my timeframes better. I am determined to be reliable for people who are supportive. For now, I’ll wrap this project up and start preparing for the next. Kickstarter is a great way to get capital for game production so it seems a useful next step on a few of the other games. We’ll see what happens with timing and specifics; I’ll be in touch online. I know one thing, once everyone has their rewards it’ll be a sigh of relief. 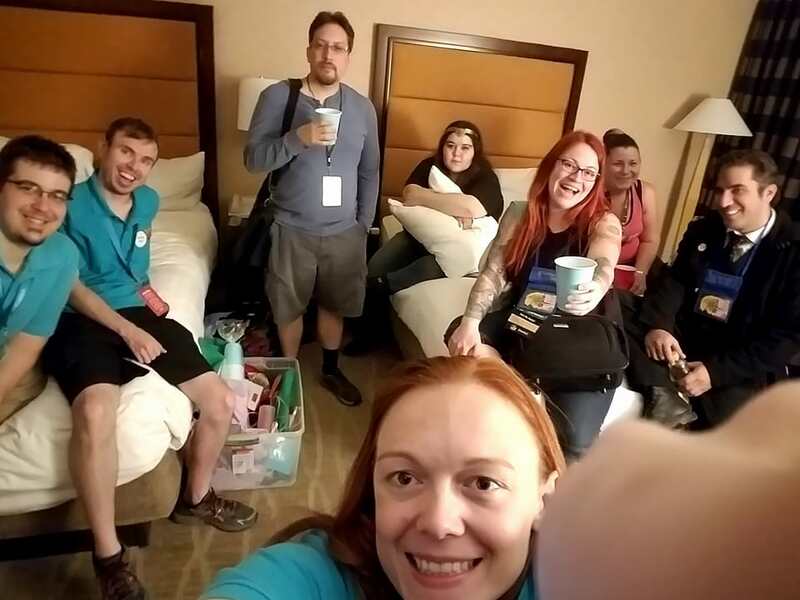 The event ended two days ago (March 28th was the last day) and I spent all of yesterday unpacking and organizing everything post-con. Now I can plan more thoroughly for upcoming events, but I promised a recap and here it is! We had three panels at Phoenix Comicon. 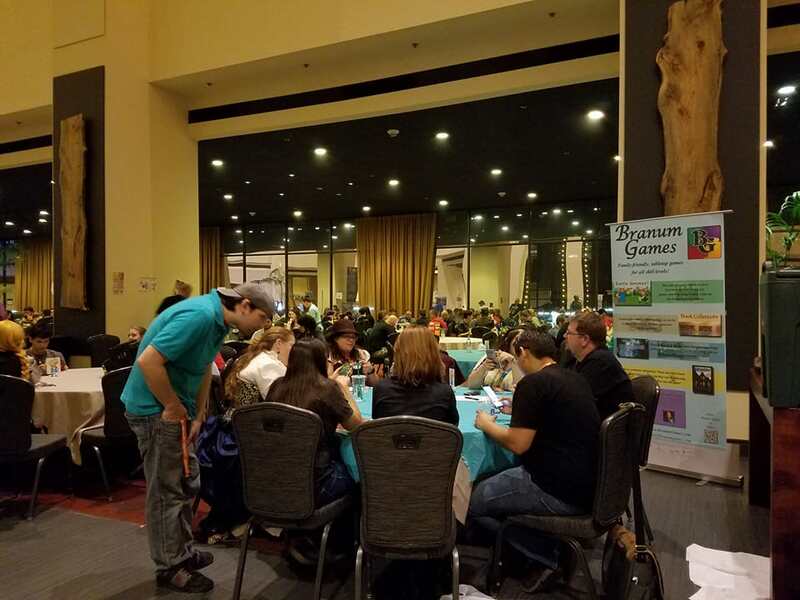 I did my first panel related to Branum games earlier this year at Strategicon, and my second at this event. Even though the company had three panels, I was personally on just one of them. I wanted to encourage team members to share their experiences and knowledge via panel submissions and it went well. All of them were on Thursday, with the last one ending during the first hour of gaming and just before our table opening up so we started with these panels for the weekend. The Branum Games Artists did the first panel. Two of the three have other artistic outlets, so Branum Games isn’t the only thing they’ve worked on but it was the link between them. Their panel was about doing artwork specifically for tabletop games. The panel was at 10:30AM on Thursday, about an hour after the show started. We expected no one to show up for it since it was such an off time. I mean, we did hope for about a dozen people. Instead, we got a full room with people standing around the sides at the back of the room. It was a great turnout, and a very successful panel. The artists had information that the crowd really wanted to learn about. I’d love to see this panel run again. 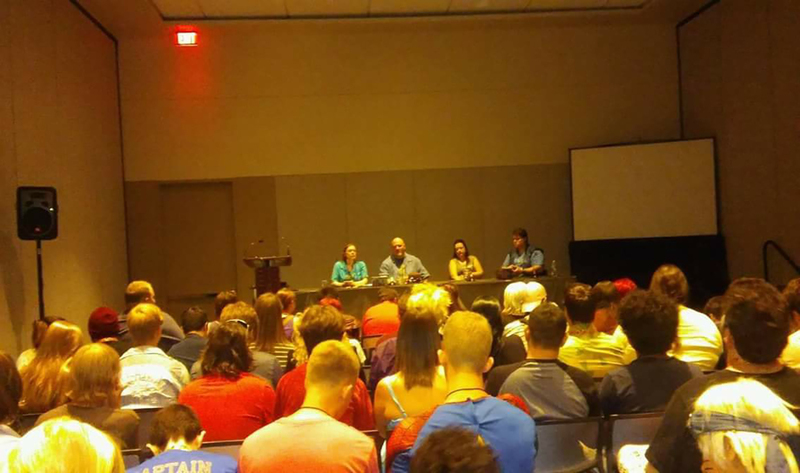 The second panel at 1:30pm Thursday was my Careers in the Gaming Industry panel. I was once again concerned about attendance, but it did not turn out to be an issue. We had a lot of people who showed up for it. I shared the stage with a gaming artist from Chain Reaction Studios, and the owners of Magic Meeple Games. The focus was to be different kinds of careers and roles in the industry. I tried to be thorough, and to create career options for the audience, sharing the different necessary things for people to contribute. Some people want to be involved, and aren’t sure what part they could play. We fortunately got it recorded so I’ll be able to post the panel on YouTube and here on the website. The third panel at 3pm that day was interesting because it was from the volunteer gaming staff members. They had not before done a panel, unlike members of the previous two panels. There was slightly less interest, because it was still Thursday which is a slow day. Also, I found the two industry panels that involve learning more about how to get involved were more attractive to the guests. 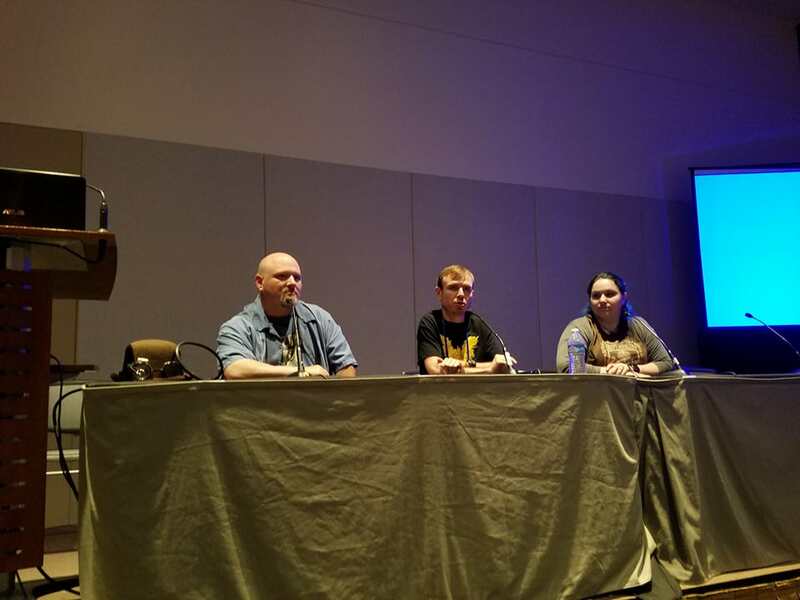 I do not know if PHXCC will permit us to run this panel again; I think that it would have to be modified because it ran a little bit shorter than expected even with 4 presenters. At the very least, these team members have experience now and we can modify future staff panels as necessary. It was an excellent learning experience and I’m glad my team was able to present. Over in the Hyatt, we started at 3pm in the gaming area. We had 3 tables featuring six of our games; two in particular were assigned to each table. We had Battle Gnomes on the same table as House Monsters because both are so cute; we had Steam Masters and Book Collectors on the same table; they seem to appeal to the same audience. On B-3, we have Dungeon Break and Nocturnes which are slightly more adult. We didn’t go nonstop like last year because Game Central enforced hour long breaks in the schedule. It made it look less full, but it was good to have the third table. The 8 GMs all showed up for their shifts; and we had a fun new banner. The only other real news is that we were taking and encouraging feedback on the newer of the games, and got some great comments. The most challenging thing about having the games played is not having them for sale. When people get upset they can’t purchase the games, I feel both proud, and bad that I am not at that point yet. I’ll get there, but it still feels crummy that if I just had the product, I could sell it! We’ll get there. This year we had our first PHXCC Exhibitor Table! 😮 It was my first time being a vendor. Because I was watching the table and the gaming area, along with any random errands, I only put myself on the schedule for a few hours on Saturday. However, I wound up being at the table for a lot more time than that. I’m getting used to the promoting/table stuff. Unfortunately, it also meant I lost my voice at the end of the weekend. It was a great learning experience; the setup, and planning techniques that will help in future vending experiences. It went quite well. We didn’t have as many visual aids as most other booths but our banner was strong enough to make a statement, along with a teal tablecloth. It was enough to look full (along with a table stand and the games). I hope to have more for the future but it’s good to know which items fill the space for now. The biggest show for us of the year is coming up! 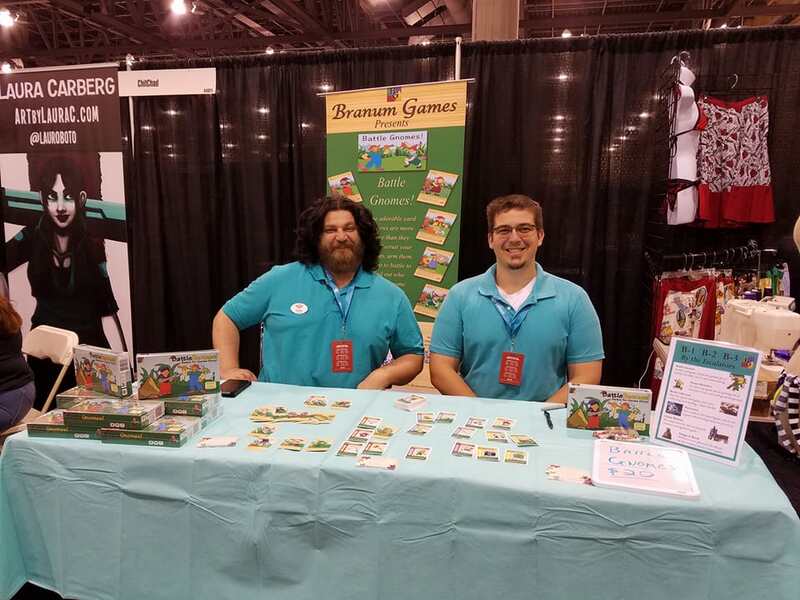 It’s not a gaming specific show, but gamers in Arizona who go to conventions usually go to this one, along with a lot of people who have other hobbies and might be interested in what we have to offer. Phoenix Comicon is a fun, huge show and we have had a lot of support from them and their attendees. This year, we’ll have 3 gaming tables in the Hyatt to demo the games at instead of 2. This means 1 more gaming table for us to play games at! I have 8 GMs this year instead of the 6 from last year, and scheduled more breaks for the tables. This year, we will play 3 games that we played from last year (Battle Gnomes, Nocturnes, and Book Collectors). We will also be playing House Monsters which is a completed game, and there are two games we are bringing specifically as prototypes. This means we will be seeking feedback from the game players regarding game play. These are Steam Masters and Dungeon Break. I also have an Artist’s Alley table that came up unexpectedly. It was given up by another, and they offered it to me. Next year I’ll get my own. The downside is that the original recipient has been getting the emails, and will be in the program book. I’ve still been getting the information, but the program book listing would have been nice. Next year we will definitely get one of our own. Now, I am still waiting on games to arrive but they should be here next week. The event is next week; so, I may get them before the event or during the event. I haven’t made promises to anyone about selling games at the event, because I don’t have them yet in hand. I hope that can happen. Otherwise, it’s a promo table and we optimize the use of it. Artists in the Gaming Industry. Thursday May 25th. 10:30am. Hosted by: Branum Games Artists. How to be Grunt: Gaming Staff. Thursday May 25th. 1:30pm. Hosted by: Branum Games Staff. Panelists: Corey Stillwell, Whitney Stillwell, Tim Aldridge, and Shawn Dempsey. Careers in the Gaming Industry. Thursday May 25th 3pm. Hosted by: Branum Games & Magic Meeple Games. After PHXCC is over, I’ll post updates and of course I’ll upload pictures on social media. I hope that supporters will come to our panels or play our games; I love seeing people who enjoy what we do! I’m super excited, I’ll post after the con!